I like to think my photography game has improved over the years – exhibit A, B and C. It’s still not the best it could be, but I’m proud to say I’ve upped my game, and put a lot of time and effort into perfecting my content. 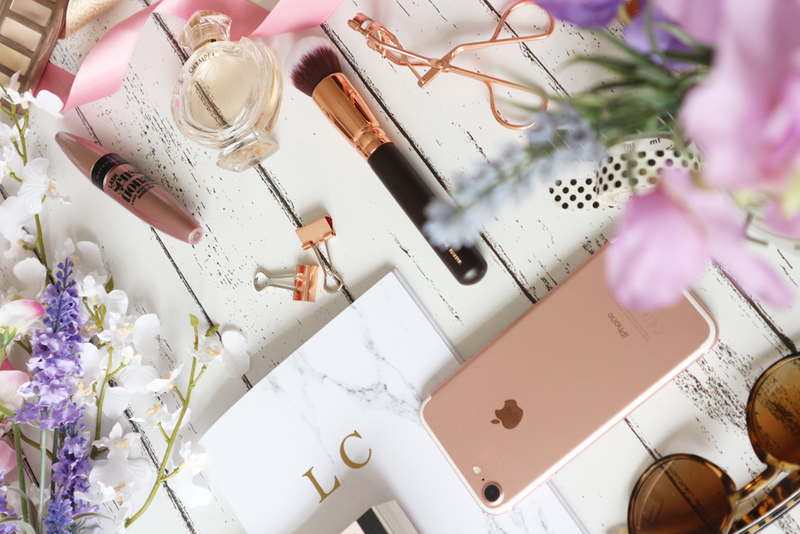 Flatlays are still something relatively new to me, but they’re one of my favourite styles of photos to take, albeit the messiest too. 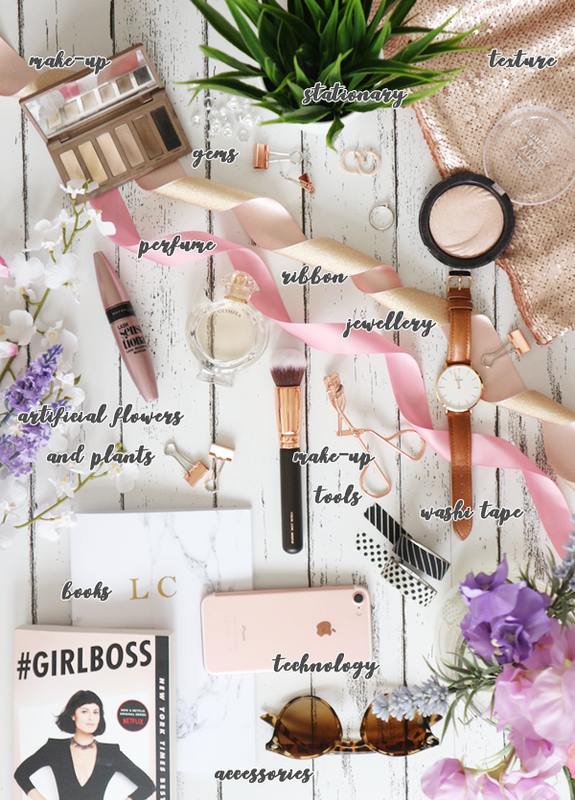 I like to think I’ve got myself a little collection of props and accessories perfect for any flatlay and thought I’d share them with you..
Make-Up & Make-up tools. 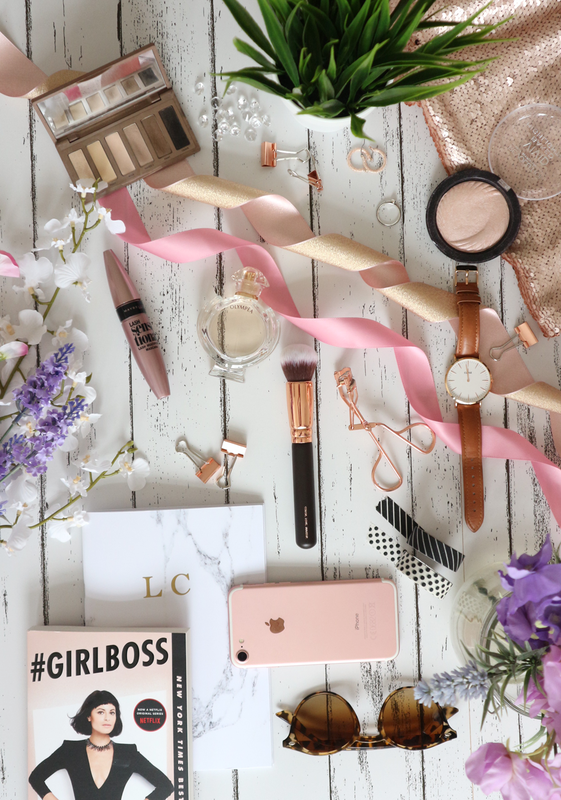 Make-up is an easy one – I have a few pretty highlights and palettes I like to sneak into my flatlays, and when your brushes and eyelash curlers are copper, can you really avoid using them too? Stationary. Every blogger has pretty stationary. I picked up some copper clips from Wilko a while ago, and my friends got my the cutest marble notebook for my birthday this year. Washi tape is also a great addition! Books. Books are another easy one, they can also be useful for product shots. Technology. I often shoot with my laptop or phone in shot. Ribbon & Gems. 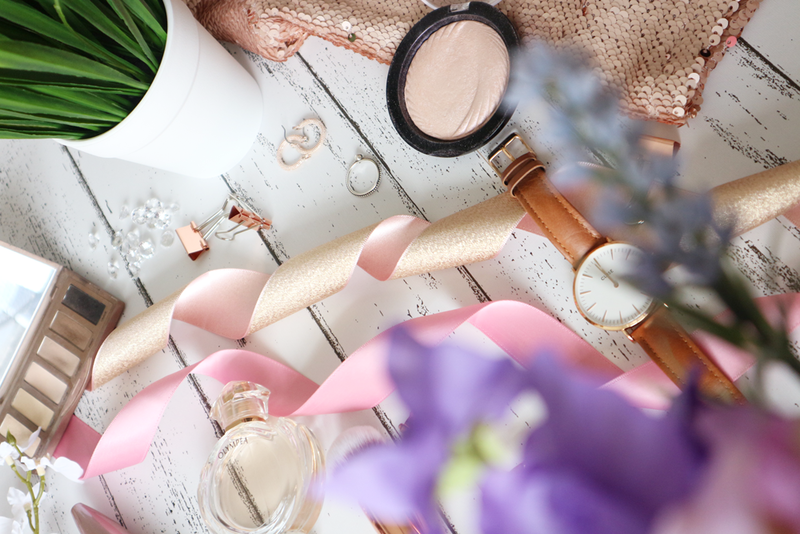 Ribbon can be so pretty to run through flatlays – you can easily pick this up from a craft shop or online for really cheap. The gems I found in The Range, perfect for a little glam! Accessories & Jewellery. I have some really pretty jewellery and often put my sunnies or watch in a flatlay too. Fake flowers/plants. I love having artifical plants in my room – real flowers are too much maintenance! I bought this grass pot from wilko and the lavendar bunch from BHS years ago (rip). You can also get fake flowers from places like The Range, Dunelm and online. Perfume. Perfume always comes in pretty bottles – put that to use! And there we have it! Hopefully you found this post useful. For me, my bog photography is all about experimenting and playing about with things until I’m happy with how it looks. It’s all bout picking bits and pieces up here and there and making a collection of useful props. What are your favourite flatlay props to use?